​Irish Fuggins has spent 20 years of his total 31 years of driving with CalArk. He drove for other reputable companies in the industry but says CalArk has always treated him nice and he has nothing to complain about. Rebecca Melton, Operations, says Irish is a great guy who, "can be a handful but I have always enjoyed working with him and his driver manager knows how to handle him and keep him happy!" Michelle Finn, Irish's Driver Manager says, "Irish and I make a great team. He's one I can depend on for pretty much anything. He might fuss at me at times, but he always comes through for CalArk and for his dispatcher. I could not ask for a better driver." Irish is from Shreveport, Louisiana, where he has lived his entire life. He and his wife Vickey have been married for seven years, and have four children and twelve grandchildren between them. Since he is from Louisiana, Irish has been given the CB handle "Crawfish" or "Fish" for short. When he isn't driving a truck, he loves to fish for Bass and White Perch. He doesn't get to fish as much as he would like to right now, but says when he retires you will be able to find him at the lake. Irish also likes to watch any kind of sports, but his favorites are tennis and golf. He also likes to listen to R&B and Country Music. Over his 20 years with CalArk, Irish has accumulated many awards and accolades. 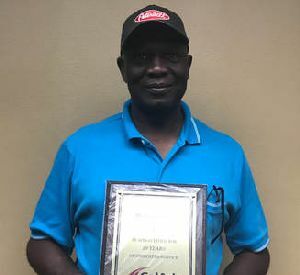 He has received 100,000 to 900,000 Miles Safe Driving, 100% On Time Delivery each year, 5 Years of Service Plaque, 1 Million Miles Safe Driving, 10 Years of Service Watch, 2 Million Safe Driving Miles, 2.5 Million Safe Driving Miles, and is currently working on 3 Million Safe Driving Miles. When asked what he attributes his success to Irish says, "providing for my family has always been my #1 encouragement." He says he is also willing to make sacrifices and do what it takes to get the job done. Irish says that, "new drivers need to have the ability, understanding, and willingness to sacrifice." He adds, "watch your surroundings, be careful with your speed and turns, and watch your weight." Thank you, Irish, for 20 years of stellar service with CalArk. We look forward to many more. It's drivers like you who keep the Wheels of American Business rolling. 100,000 to 900,000 Miles Safe Driving, 100% On Time Delivery each year, 5 Years of Service Plaque, 1 Million Miles Safe Driving, 10 Years of Service Watch, 2 Million Safe Driving Miles, and 2.5 Million Safe Driving Miles.